If you’ve been looking for a dedicated, knowledgeable gynecologist, look no farther than Rosalind Jackson, MD. She and her caring team at Total Health and Wellness: Center for Personalized Medicine in Miamisburg, Ohio, work to ensure that every patient they see receives the best care. Whether you need a general gynecological checkup or have a specific issue you need to have treated, they offer top-tier care and innovative treatments. Call Total Health and Wellness: Center for Personalized Medicine or request your appointment online today. How do I find the right gynecologist? Finding a doctor you like and trust is always tricky, but that’s perhaps most true in the field of gynecology. Gynecological problems can be sensitive and uncomfortable to discuss. Having the right gynecologist behind you makes getting the treatment you need so much easier. That’s why Dr. Roz and her team are dedicated to offering warm, knowledgeable care to every woman they see. From your first appointment to your annual checkup to specialized treatments, they’ll work with you to ensure you’re feeling your healthiest and most vibrant. How do I treat my gynecological problems? If you’re a woman who still gets her period, knowing whether or not to go to a doctor for pelvic pain can be tricky. But Dr. Roz keeps her door open. You might be experiencing your usual cramps, but you could be suffering from endometriosis. Dr. Roz is available to answer all of your questions and help you feel comfortable. If you’re perimenopausal, menopausal, or postmenopausal, you can expect the same level of care. Dr. Roz knows that these hormonal changes can bring a whole host of unwelcome symptoms like brain fog, urinary incontinence, and sexual discomfort. She offers a range of treatments to restore the quality of life for women going through these major changes. 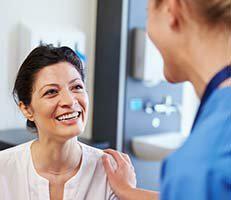 What kind of gynecological treatments are available? Dr. Roz and her educated staff at Total Health & Wellness OBGYN work to offer the safest, most groundbreaking treatments to their patients. If you want the most effective, least invasive way to alleviate menopausal symptoms, pelvic pain, or another gynecological issue, they are here to help. For example, if you suffer from endometriosis, Dr. Roz can perform an endometrial ablation. This surgery doesn’t require incisions. Instead, she can access the surgery site via your cervix to remove the endometrium, or lining of your uterus, that’s causing you painful, heavy periods. Similarly, Dr. Roz believes that hysterectomies shouldn’t be major, painful procedures. She offers same-day hysterectomies, allowing you to have your hysterectomy performed, then return to the comfort of your home the same day. If you would like more information about the gynecological services available to you, call Total Health and Wellness: Center for Personalized Medicine or request your appointment online today.